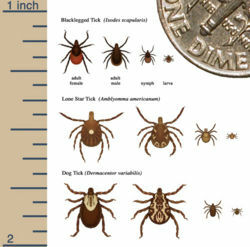 Ticks are a group of species of arachnid known for their parasitic life-style. They have four pairs of legs and are effectively balloons with mouth parts. They are known for transmitting Lyme disease, usually by the sheep or castor bean tick, Ixodes ricinus. Ticks have a complex life cycle involving both nymphal and pupal stages, which requires blood meals between each. There are two main subgroups of ticks, hard ticks and soft ticks. This page was last modified on 24 June 2016, at 18:17.